When faced with the task of choosing office furniture for your business it is an important task not to be taken lightly. The furniture you choose will set the design, feel, ambience of the office for the staff and any customers/visitors that come to you. You will want to make it a comfortable atmoshpere but also professional to suit your business. A desking system is always the focal point of any office fitout, it will lead the way for the purchase of all other furniture including storage systems, meeting rooms and reception. Each area is unique in it's application in relation to the business you are in e.g. normal office duties require standard size desks, accounts may need more space and storage and designers will need extra areas for looking at plans etc. Look for matching colours from the one supplier, if the products are imported or have imported components, colours will not match between different suppliers and you will end up with a myriad of colours and thats not a good look. Make sure the office furniture is strong and with a good warranty, preferably 5 years, this will ensure you get commercial grade furniture that will last. 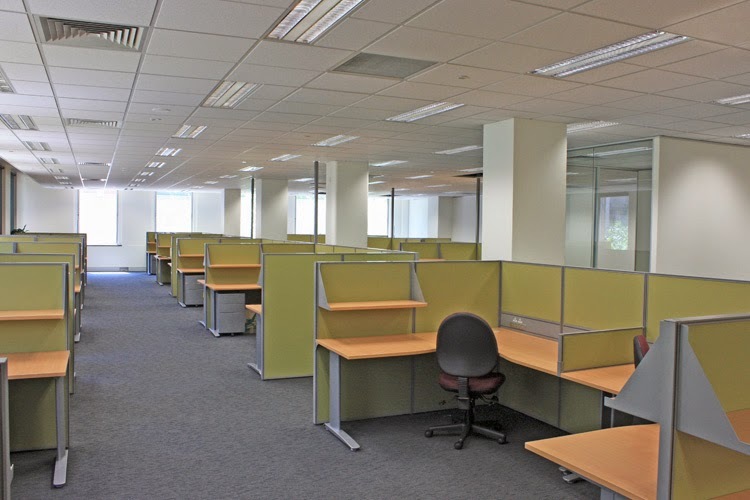 Even though a commercial office fitout can provide your workplace with a large number of benefits, it can prove to be quite a stressful project that takes up a large portion of your time and budget. One of the most important things that you can do in preparation for your fitout is to plan it carefully, from start to finish, to ensure that everything is covered. Set goals – Make sure that you determine exactly what you're trying to achieve well in advance of work starting. Are you reflecting a recent rebrand, fitting in new employees or moving to a new office? Keep a checklist – Make sure that you list down all of the requirements of your project with matching timelines. Stick to this checklist at all times and mark off things when they are done. Don't compromise – Make sure that the quality of your fitout is kept in the forefront of your mind. Whilst it might be tempting to save some money, you should never sacrifice on quality. Include everything – Make sure that you haven't forgotten to include things like IT infrastructure, telephone and power outlets, and storage in your budget; these things all start to add up. Do research – Make sure that you have researched the current trends and innovations of the fitout industry; are you planning on using any of these in your project and, if so, how will they succeed? Consider safety – Make sure that all the safety requirements of your building have been assessed, including the placement of fire extinguishers and sprinklers, smoke detectors and exit signs. Consult professionals – Make sure that you have consulted some fitout professionals for advice and recommendations. This will ensure that your project is as successful as possible. By following each of the points that we have outlined above, you can rest assured that your upcoming commercial office fitout is a success. It is important that you have carefully planned your project, as this will ensure that every single aspect has been covered and that you are able to stick to your budget. Without a plan, it's likely that the whole project will fall apart. To ensure that your workplace runs smoothly, every employee needs access to an office workstation that has a secure and consistent supply of electricity. The modern array of computers and electronic devices means that the workstation should feature several types of power access. You might also need a secondary source of electricity, just in case of an emergency. Your workstation will require access to one or more standard 120 volt wall outlets. They can be of the two- or three-prong variety. You should also install a surge protector so that you can convert a single outlet into a strip of six or more, allowing you to power a range of devices (such as a computer, monitor, printer, fax machine and telephone). The workplace should also be designed so that there are enough individual circuits to prevent an overload. Another form of power that many office workstations require is USB (Universal Serial Bus) power. This works as both a connector and a power supply. Items with larger power needs (such as a printer) may use a USB outlet to connect to a computer and may require a separate power source. Smaller devices (such as keyboards and mice) only need a USB connection. The best solution could be a USB hub, which is plugged into a power outlet. Some workplaces will also require emergency or back up power. Hospitals and emergency management offices, for example, will need to keep operating in times of crisis. More often than not, this will require a generator or backup power supply that will engage (and send electricity through to standard outlets) in the event of a power outage. An uninterruptable power supply (or UPS) can provide power for a single workstation in case of a power outage. There are a number of factors that affect the way we buy and utilise office space, but did you know that current or budding office design trends is one of the main trends? Trends are something that many companies don't really consider when making real estate decisions. We have outlined 9 current and budding trends to ensure that you are up to date with what’s happening in the industry. If your company first began as a few people sitting around someone's garage, it is important to understand that moving into a larger, more traditional workspace is going to affect your output. You should consider providing a space that is collaborative to support ‘team time’. More offices are shifting towards an alternative work environment – each employee has a smaller workstation. When placed in a circular formation, the centre can be used as a conference space and encourages discussion and collaboration. Some companies with open plan designs are choosing to cut about 300mm off each employee workstation, using the saved space to create a small, collaborative hub. This is where employees can come for some quiet research time or to make private phone calls. With more companies accepting the idea that employees don't need to be at their desks in order to be productive, hotdesk spaces are becoming more popular. Often, this incorporates a telephone, a smaller and more open desk with easy access to internet and power points. Shifting technologies (such as cordless phones and laptops) continue to disconnect employees from their workstations. Basically, if something is not within 2 to 3 metres of the employee looking for it, it’s not useful. Only immediate files should be kept on hand, for example. These days, activity-based planning is actually key to space design – we need to re-plan buildings based on what employees actually do. Even though we often have smaller workspaces, we have more activities to choose from (such as collaborative spaces, open conference rooms and mobile workstations). There seems to be a shift from space being allocated by title to space being allocated by how much time you spend at work. A receptionist who spends all 8 hours in the building will be allocated more space than a sales person who spends 6 or 7 hours out on the road. The reality is that some jobs are very tied to their spaces. A receptionist spends their day tied to the desk, answering the telephone and making appointments. A helpline worker also spends all day answering phone calls, but they often ask questions to those around them. Companies looking for a new building are looking for more flexibility, which actually translates into lower construction costs and lower tenant improvement costs. Going to fewer than 17% private offices in a floor layout will cut drywall costs by up to a third or even half! Some people even believe that, eventually, the building itself and its infrastructure will link together. The walls will contain technology that talks to the furniture, which talks to the floor and so on. Whilst this is a trend that won't be around anytime soon, it is interesting to think about how such developments and changes will affect how we buy and utilise office space.